For other people named Maria Theresa of Austria, see Maria Theresa of Austria (disambiguation). Maria Theresa of Austria (Maria Theresia Isabella; 31 July 1816 – 8 August 1867) was the second wife of Ferdinand II of the Two Sicilies. She was the eldest daughter of Archduke Charles, Duke of Teschen and Princess Henrietta of Nassau-Weilburg. Her paternal grandparents were Leopold II, Holy Roman Emperor and Maria Luisa of Spain. Her maternal grandparents were Frederick William of Nassau-Weilburg (1768–1816) and his wife Burgravine Louise Isabelle of Kirchberg. On 9 January 1837 in at the Augustinian Church in Vienna, Maria Theresa married Ferdinand II of the Two Sicilies. The bride was almost twenty-one years old and the groom twenty-seven. At the death of her spouse, she intended to continue her political activity by being the advisor to her stepson Francis, the new monarch. Francis was willing, and her authoritarian policy has been considered to contribute to the public discontent which led to the abolishment of the Kingdom of Naples. Francis' spouse Duchess Maria Sophia in Bavaria, however, disputed her influence and Francis had a difficult position in the conflict between his wife and stepmother, without being able to satisfy either. Maria Sophia informed Francis about a plot created by Maria Theresa with the attempt to put the biological son of Maria Theresa on the throne, but Francis chose to believe Maria Theresa when she swore her innocence. It was not until the revolts against the monarchy had already begun that Francis decided to listen to the advice of his wife rather than his stepmother. Maria Theresa was among the first to leave Naples during the revolt: first to Gaeta with her children and advisors, and then to Rome. She resided in the same palace that Francis and Maria Sophia would use when they arrived. She died from cholera, nursed by her stepson Francis, who mourned her greatly. Lodovico, Count of Trani 1 August 1838 8 June 1886 Married Mathilde Ludovika, Duchess in Bavaria, sister of Empress Elisabeth of Austria. Their only daughter, Princess Maria Teresa of Bourbon-Two Sicilies, married Prince Wilhelm of Hohenzollern-Sigmaringen. Alberto, Count of Castrogiovanni 17 September 1839 12 July 1844 Died in childhood. Alfonso, Count of Caserta 28 March 1841 26 May 1934 Married his first cousin Princess Antonietta of Bourbon-Two Sicilies and has issue. The current lines of Bourbon-Two Sicilies descend from him. 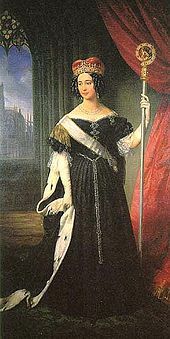 Maria Annunciata of the Two Sicilies 24 March 1843 4 May 1871 Married Archduke Karl Ludwig of Austria. Maria Immaculata of the Two Sicilies 14 April 1844 18 February 1899 Married Archduke Karl Salvator of Austria, Prince of Tuscany. Gaetano, Count of Girgenti 12 January 1846 26 November 1871 In 1868, he married Isabel, Infanta of Spain (eldest daughter of Queen Isabella II of Spain) and was created Infante of Spain. Giuseppe, Count of Lucera 4 March 1848 28 September 1851 Died in childhood. Maria Pia of the Two Sicilies 21 August 1849 29 September 1882 Married Robert I, Duke of Parma. Vincenzo, Count of Melazzo 26 April 1851 13 October 1854 Died in childhood. Pasquale, Count of Bari 15 September 1852 21 December 1904 Married morganatically to Blanche Marconnay. Maria Louisa of the Two Sicilies 21 January 1855 23 February 1874 Married Prince Henry of Bourbon-Parma, Count of Bardi. Gennaro, Count of Caltagirone 28 February 1857 13 August 1867 Died in childhood. Marek, Miroslav. "A listing of descendants of Archduke Charles, Duke of Teschen". Genealogy.EU.